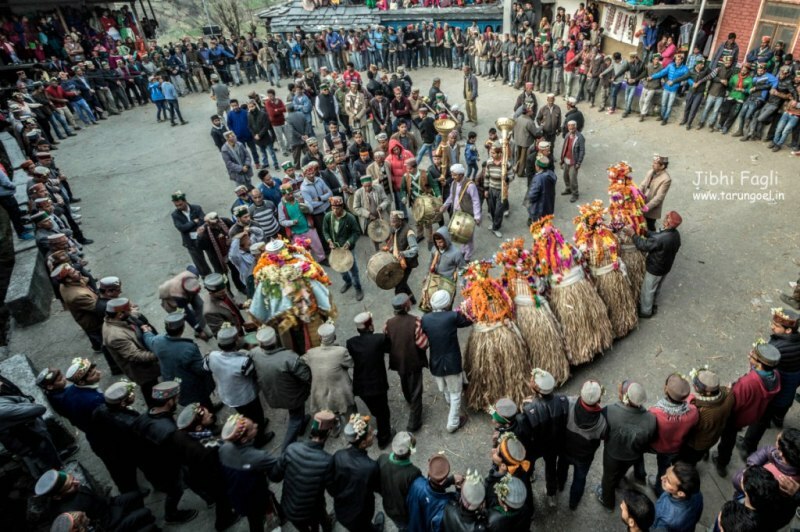 Fagli, locally known as Kus or Kuns, is one of the most famous festival of the Pattan valley (Lahaul-Spiti). It falls, after a fortnight of Khogla on Amawasya (in first or second full moon week of February. The houses are fully decorated and oil lamps are lit similar to the way as festival of lights, Diwali, is celebrated. A Baraza is set-up which consist of a bamboo stick, two to three feet tall, mounted on the floor. Around the stick a white chader is draped in such a maanner as to suggest an angel dressed in white, sitting in the corner, ornamented with jewellery and marigold flowers. Delicious dishes are placed before the Baraza along with burning incense. The Baraza represents the angel (SHIKHARA- APPA) grand mother of the peak and her visit is considered to bring prosperity to the house. According to the ritual demand, the head of the family and his wife getup early in the morning to prepare Totu (A dough of roasted barley flour and butter milk) and Kwari. The Totu is taken onto the roof which is offered to the deities. Kwari is later offered to the crows who await for it as if they have received a formal invitation. The totu is distributed among the family members as prasada. The couple goes to pay their annual respects to their cows and sheep to express their gratitude and acknowledge their dependence on these animals. Rest of the family members getup and pay their respects to their elders of the household by bowing to them and touching their feet. After breakfast, they first visit their nearest and aged-person within the village and then the entire village community congregate to pay their respects to each house with Marchu (Local puri). Each day of the festival has a special name that depicts its own significance. One day is called punha, a symbolic representation of ploughing the fields. Since the fields are covered under snow during the period, so symbolic ploughing is done. Two green willow sticks representing the bullocks and two more representing yoke and plough are moved forward in the room in the front of the Baraza. In the following weeks feasts and festivities continue among relatives and friends, along with the exchange of marigold flowers and other gifts. So, this is how the fagli festival is celebrated in Lahaul-Spiti which emanates the message of living happily together and staying in touch with our motherland, ancestors, cattle and birds because these are the only real treasure that god gave us. Thanks for sparing your precious time in reading our post. Lot more coming.